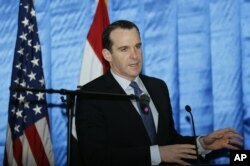 Turkish officials and Western-backed Syrian rebels are once again highlighting the trip by President Obama’s special envoy Brett McGurk to try to explain subsequent clashes between U.S.-backed Free Syrian Army factions and U.S.-backed Kurdish fighters in northern Syria. The daylong visit to the battered town of Kobani, which withstood a months-long siege by Islamic State militants partly thanks to American airstrikes, was controversial the moment news of the trip broke and prompted protests from Turkish officials. They were infuriated with McGurk’s meetings with leaders of the Kurdish Democratic Union Party (PYD), an offshoot of Turkey’s own outlawed Kurdistan Workers’ Party (PKK), which Ankara sees as a terrorist organization. Washington’s support of the PYD, has proven to be one of the most contentious issues dividing the U.S. and Turkey — along with Washington’s insistence that defeat of the Islamic State should take priority over the removal of Syrian President Basar al-Assad from power. Washington views the PYD’s armed wing, the People’s Protection Units (YPG) as its most effective ground partner in the fight against the Islamic State. But Ankara fears Syrian Kurds are determined to carve out their own independent state along the border with Turkey. According to the U.S. State Department, McGurk’s visit, which came a week late for the first-year anniversary of the lifting of the IS siege on the town, was to review the U.S.-led international coalition’s fight against IS. The explanations did little to mollify Ankara — or Syrian rebels — then or now. With the YPG fighting Western-backed FSA factions in the northern Aleppo countryside, McGurk's visit is being seized on again with anti-Assad rebels and Turkish officials questioning whether PYD leaders divulged their plans to McGurk for a Kurdish land-grab in northern Syria. "The State Department has seen no indication that the elements of the SDF that the U.S. is working with have moved west of the Euphrates” into the northern Aleppo countryside, an official said. If McGurk’s visit was controversial at the time of the trip, it has become even more so since the Assad regime unleashed a war-changing offensive on February 4 across the northern Aleppo countryside with Russian air support. A video grab made on October 12, 2015, shows an image taken from a footage made available on the Russian Defence Ministry's official website, purporting to show explosions after airstrikes carried out by the Russian air force. 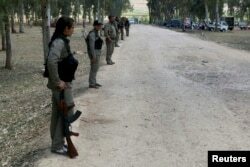 Syrian rebels claim the Kurds have been assisting the regime by grabbing from them a series of towns, including Tell Rifaat, and an airbase anti-Assad insurgents have controlled since August 2013. And they claim the Kurdish-dominated SDF has been coordinating their attacks with the Russians and President Bashar al-Assad’s regime. The YPG denies the claim. Daily Sabah columnist Kılıç Buğra Kanat is one among several Turkish commentators re-examining McGurk’s visit and arguing it prompts “increasing questions regarding U.S. policy in Syria.” And for days social media sites have been full of postings by FSA supporters, Turkish nationalists and members of Turkey’s ruling AKP party questioning the purpose of the trip. “Is it a coincidence attacks on FSA by YPG have risen since @brett_mcgurk's visit to Kobani,” tweeted one FSA supporter. “No document has passed my table suggesting the U.S. knew beforehand what the PYD/YPG was planning to do — even so, the timing of the visit is in hindsight deeply unfortunate,” a European diplomat told VOA. Last week, Turkey joined the fray in the battles raging in northern Syria, firing off salvo after salvo of artillery and tank shells at YPG positions. In the wake of the Feb 17 car bombing in Ankara that left 28 dead, which the Turks blame on the PYD, the threat by Turkish authorities to launch some kind of anti-Kurdish ground offensive inside Syria to help anti-Assad rebels has taken on an even more ominous character. The U.S. is urging both Turkey and the YPG/PYD to show restraint — an appeal that is infuriating Ankara, which sees Washington placing the Turkish government on the same par as the PYD, an organization it considers a terrorist group. In turn, the Turkish shelling is frustrating for Washington. U.S. officials fear unless it stops, Moscow will persist with airstrikes in northern Syria, dooming any chance that a cessation of hostilities agreed in Munich by foreign powers on Feb. 12. FILE - Kurdish Democratic Union Party (PYD) members stand guard during a Labour Day celebration in Efrin. The U.S. is urging both Turkey and the YPG/PYD to show restraint. On Friday, in a phone conversation lasting one hour and 20 minutes, Ankara said President Obama had told Erdogan that Turkey had a right to self-defense, and expressed worries also over advances by Syrian Kurdish militias near Turkey's border in the northern Aleppo countryside. Obama stressed to Erdogan that YPG forces should not seek to exploit recent gains by the Syrian regime in northern Syria to seize additional territory themselves, the White House said in a statement. Turkish officials say Erdogan did bring up McGurk’s February 1 visit to Kobani. Amberin Zaman, the long-serving Turkey correspondent for The Economist, argued this weekend on the American news-site Foreign Policy that McGurk’s Kobani trip was prompted by U.S. fears about the Syrian Kurds defecting to the Russian camp. “The Kurds are skillfully playing the Russians and Americans off of each other to extract as much influence as possible,” she maintains.